The wonder of the moon has been a constant, ever since people first walked on earth. Many people have found it a great source of comfort during periods of separation from loved ones. It can be seen as a form of unifying presence, which creates a unique feeling of closeness between people even though they might be miles apart. 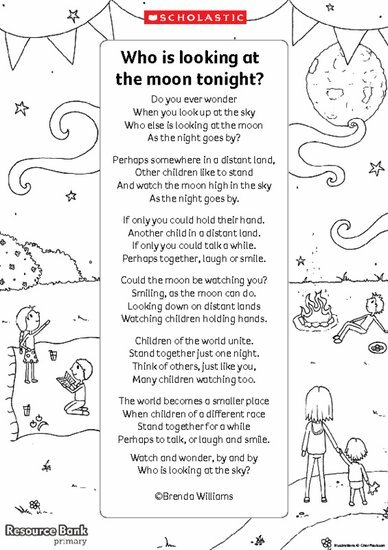 This poem seeks to instil a sense of unity with children of the world. It talks about children that your class may never have met, and whose lives are very different to their own, but it demonstrates that we can still feel the same emotions as these children. It makes us aware of a common bond. Story corner activities for Whatever Next!